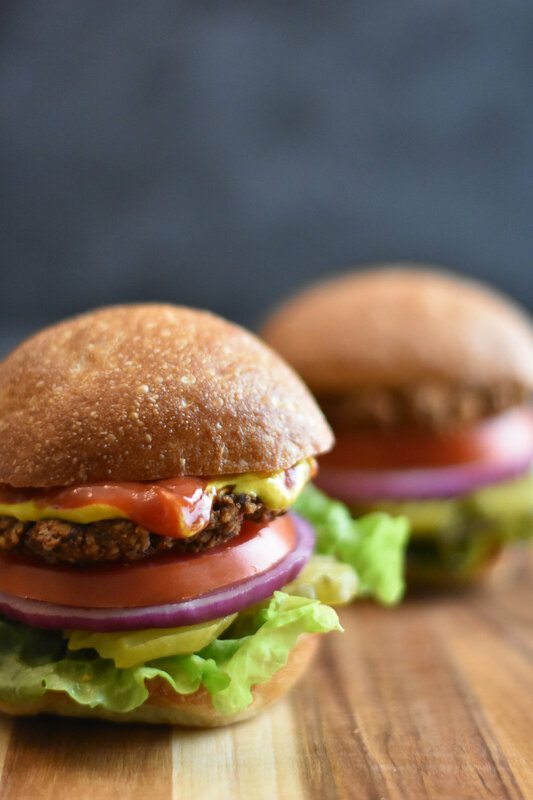 This black bean burger has incredible texture and taste without any added oil, except a little spray-oil (which could be skipped, but it helps crisp the surfaces). The burgers are baked rather than pan-fried, which not only saves on oil but also eliminates time standing at the stove. Big thanks to Matt Frazier, the No Meat Athlete, for the starting point of this recipe, his Veggie Burger Formula. These freeze well, meaning great leftover meals! Preheat the oven to 450 degrees. Line two large sheet pans with parchment or foil. Spray with oil. Transfer the vegetables to a food processor and pulse with the following ingredients until nicely combined but still chunky. Form 3-4" patties (fairly thin) with your hands and lay them on the parchment paper. Spray the tops with spray-oil. Bake for 12 minutes, then flip them over and bake 8-10 minutes more or until firm with brown surfaces. Serve on English muffins or other bread. Nutrition: The ketchup, spray-oil, and vital wheat gluten keep this from being 100% whole-food unprocessed. Pretty close, though!